The health benefits of eating kale stem back generations in my family, curly Kale having been a winter staple in my mother's repertoire of hearty, Irish dishes. Even in deepest January, when the ground was frozen, she could dig up some kale from the vegetable patch and whip up a vitamin-packed meal providing us with easy access to these 10 predominant health benefits, completely unknownst to us. This hearty, leafy green is quickly overtaking spinach's pole position as the superstar ingredient for conscious eating - partly due to its long list of health benefits, and also due to its unique, rich flavor. Slightly bitter with a tangy note, kale is available in several different varieties. It belongs to the Brassica family that includes vegetables such as cabbage, collard greens, broccoli and Brussels sprouts. Kale packs a powerful nutritional punch. 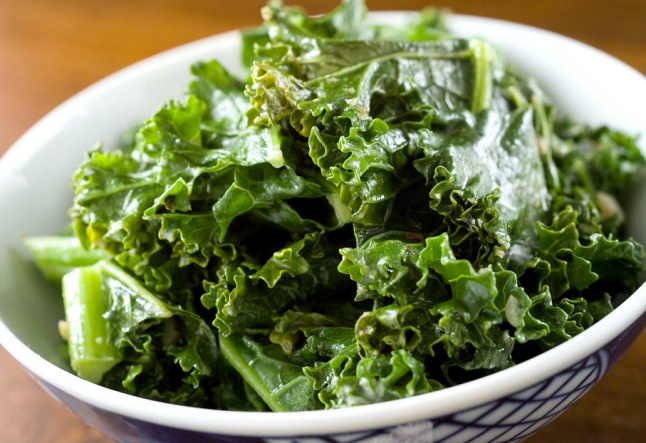 Here we list the top 10 health benefits of kale and provide a few simple recipes to start working it into your diet. You can eat it raw or cooked, using it in salads, soups, stews, stir-fries, snacks and smoothies. 1. Detox and weight loss: One cup of kale has 36 calories and zero fat. It also contains 5 grams of fiber, lowering cholesterol, and aiding in digestion and elimination. Sulfur compounds also support digestion and liver health. 2. Chock full of Vitamin C (200% of the recommended daily allowance (RDA)), which increases metabolism, supports the immune system, promotes healthy blood sugar levels, relieves stiff joints, and maintains healthy cartilage. 4. Kale contains Omega-3 and Omega-6 fatty acids, providing health benefits for skin. Fatty acids are also great anti-inflammatory component, fighting arthritis, autoimmune disorders, and asthma. 5. Packed with vitamin A (180% of the RDA), Kale helps strengthen eyes, nourish the skin, and prevent lung and oral cancers. 6. A vegan source of Calcium (15% of the RDA), Kale contains more calcium than milk, calorie for calorie. 7. Kale is a Vitamin K bomb. A one cup serving contains 1020% of the RDA. A diet high in vitamin K can help protect against various cancers. It's also necessary for bone health, prevents blood clotting, and can help with symptoms of Alzheimer's disease. 8. Hello B vitamins! Folic acid and B6 (15% of RDA) are found in Kale too, offering cardiovascular support and preventing heart disease. 9. Kale is bursting with antioxidants like carotenoids and flavonoids which help protect against cancer. To name a couple, lutein and zeaxanthin are carotenoids that filter harmful high-energy blue wavelengths of light and act as antioxidants in the eye, helping protect and maintain healthy cells. 10. Kale is also a good source of essential minerals such as copper, potassium, iron, manganese and phosphorus. Check out our healthy, delicious recipes for new ways to use this amazing green in your kitchen, and reap all the health benefits of kale.